Every girl dreams of being a princess and being famous, preforming on a big stage. And chances are, every girl will feel like the grass is always greener on the other side of the fence at least once in her life. 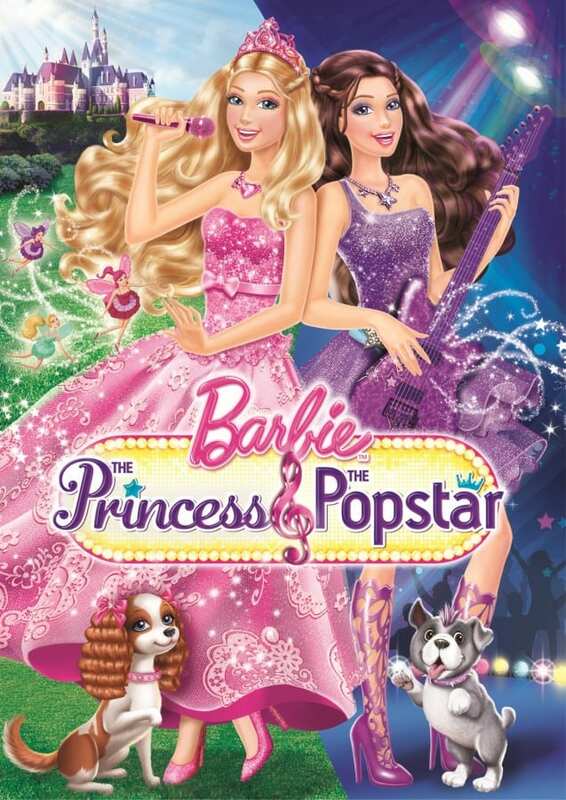 Barbie™ knows how little girl feels and she stars in the newest Barbie™ release: The Princess & The Popstar. Princess Tori and Popstar Keira are not satisfied with their lives and switch places with one another. During this movie with great musical numbers, a magical secret from the kingdom of Meribella is stolen. Tori and Keira work together to save the kingdom and soon realize that each other’s lives aren’t as easy as they seem. To go with the movie Barbie™:The Princess & The Popstar, which was available September 11, there are 2 new Barbie™ dolls to add to your collection. Barbie™:The Princess & The Popstar Tori Doll can transform into a popstar by pulling the string on the back of her princess skirt to reveal a pop-star dress and fun booths. You can also rotate her blone hair to reveal a pink pop-star do! Barbie™:The Princess & The Popstar Keira doll can magically transform into a beautiful princess by wrapping her long princess skirt around her dress. Once you rotate her purple hair she turns into a brunette princess with a crown. Both dolls include a microphone. What I find really neat about the dolls, is not only are they 2-in-1 styles, they also have musical necklaces. When you press the button on the necklaces, each doll plays 2 songs from the movie. 1 Mommy Moment reader will WIN the DVD Barbie™:The Princess & The Popstar and a 2-in-1 Tori or Keira doll. This prize pack is a $60 value! My grandaughter would love to have this. I would love to win this for my great-granddaughter, Chloe! My daughter loves barbies, when she sees this commercial she freaks out. I’m sure it will be on Santa’s list this year. Both my kids would love this doll. I would love to win this prize for my granddaughter, Keira, coincidentally the same name as Popstar Keira. Thanks for the giveaway, and good luck to all. Id love this for my daughter!! I would love to win this for my daughter as she is a Barbie fanatic. My granddaughter would love these dolls. I would love to win this for the toy drive. I would love to win this prize pack for my only daughter of 5 kids, who LOVES Barbie movies. Funny I saw your blog post tonight, as we were just singing Barbie and The Diamond Castle songs together. She was just asking for this new dvd! I would keep it for my daughter or neice for when she is older. I love Barbie. When Sara was really into Barbie, we had so much fun!! We would set up the house and furniture and play together for hours…I miss those days. Thank you for this very special contest! I would win this for my Daughter- and hope she shares with me! I’d be delighted to win it for my granddaughters. I’d love to win this for my neice Katie! I would love to win this for my daughter! She LOVES anything barbie! My daughters really really want this movie!!! The dolls are a bonus!!! I would love to win this for my neice.! She would love it! For my oldest daughter. She doesn’t have a Barbie yet, she would love this! My middle daughter loves Barbuda and she would love this!! My niece would go nuts for it! My daughter loves Barbie… she would be over the moon for this prize pack!! I’d love to win this Barbie prize for my daughter! It would be for my niece . I would totally love to win this for my daughter. Barbies were such a huge part of my life when I was little and love watching the joy they now bring to my little one. Such fun times were and are spent playing with Barbies! For a little girl I know whose birthday is fast approaching. My Grandaughter would so love this! My daughter is so excited about this movie coming out – she already has the dolls on her Christmas list. I would love to win this for my beautiful little cousins. Coffee Solutions Pinterest page doesn’t load. ERROR! My daughter just loves the Barbie videos. A Barbie doll that has her own video would cause uncontrollable excitement. I would love to win this for my neice,,she would love it,thanks! September 20-I have two little girls in mind, both of whom are in single-parent families. Neither are related to me but that does not matter if I can give them these Barbies for Christmas. I want to win this contest for my 8 year old daughter Jenaya. I’d want it for my 3 girls. They all love Barbie. I would give it to my Princess Marley!! if I won this it would definitely be for my granddaughter, she’d go crazy! i would love to win this for my daughter..sweet gift for her 5th birthday!! I would like to win this for our daughter Evey – she’s just discovered the world of Barbies! I would love to win this prize for my 6 year old daughter! Love to win for my neice! I would love to win this for my 4 year old daughter.She thinks Barbie is the greatest. My little Madisson would so love if I win this. My girls would go crazy for this!! I would love to win this for my daughter. She goes around singing holding the beater from my hand mixer. I loved Barbie’s growing up. My neice still plays with my stuff. But it would be nice to give her a few really wonderful dolls of her own. This win would be for her. I want her to have the experience with Barbie’s I enjoyed so much growing up. would certainly love to win this for my grandaughter. I would love to give this prize to my niece. My 5 year old daughter has been talking about this Pop Star Barbie – that is who I want to win it for!!! My 6 year old daughter would love this. Love to win this for my niece. She would absolutly love it!!! My 8yr old daughter would love this. I would love to win this for my niece. She loves Barbie! My 3 year old niece would absolutely love this! I would just love to win this for my friends little girl! My niece would love this gift, she is so into princesses. My granddaughter is a Barbie lover inherited from me! I’d give one to my daughter and one to her friend. I would love to win this prize pack for my daughter’s fifth birthday. Her birthday is November 19th. She has been asking me for a Barbie doll. Alyssa also loves to sing so I think the movie would be a blast! My niece received her first Barbie last Christmas and she loves her, so I would give this to her. Would love to win this and give it to my daughter for Christmas! Never to early to start thinking about the holidays! This would be for my daughter. She Loves Barbie! But, what little girl doesn’t ? Right? 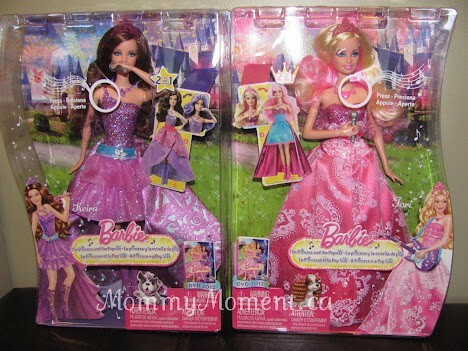 I would love to win this for my daughters who are 4 and 6 and love Barbie! The musical necklaces are very cool! This would make a fabulous gift for any little girl. My step daughter. I dont know which one of us loves playing with Barbies more! We have a great time. I loved barbie growing up! Great Christmas gifts for friends. I would like to win this for me!…but I would share with young visitors. This would be fantastic for my daughter, Jillian. My girls have been talking about these dolls since they first saw them. With their birthdays coming up, they are definitely on their list!! Oh my granddaughter would love this ! My little niece would love this. What little girl doesn’t love Barbie.